Ammonium Nitrate is a white crystalline solid. It is commonly used in the fertilizer industry, in cold packs, and in the production of yeast, antibiotics, and industrial explosives. Ammonium nitrate is an oxidizer, meaning it accelerates the burning of combustible materials, so it’s very useful in the mining industry as the main component of ANFO (ammonium nitrate fuel oil), a common explosive. Capable of coalescing into a single mass, this chemical requires a tight container to avoid absorbing moisture from the air. Ammonium Nitrate is not combustible, but it has lately been on the news for disasters caused by explosions. As a strong oxidizing agent, the chemical should be segregated from combustible materials to avoid such disasters. 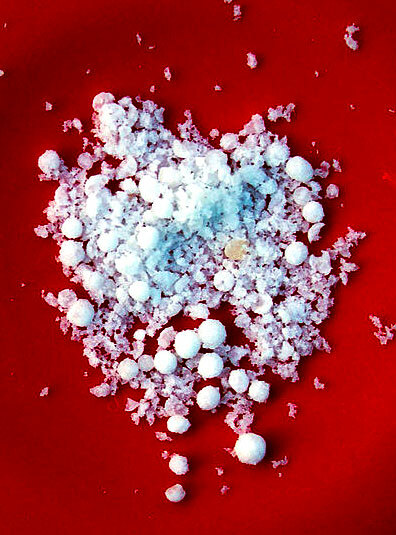 It should also be separate from other chemicals such as chromium and copper salts, urea, acids and alkalis. As the chemical is hygroscopic, the tight containers should be stored in a well-ventilated area. The chemical can undergo explosive decomposition when heated in a confined space, so it should be stored in a cool area with proper fire suppression systems. Storage construction should be made of fire-proof materials to further protect the chemical from fire hazards. U.S. Chemical Storage offers fully compliant, customizable storage solutions for your Ammonium Nitrate storage needs, including climate controlled storage, explosion relief construction, and explosion proof accessories such as fire suppression systems and ventilation. Our SUPERLoc storage building is 4-Hour Fire Rated, a safe and compliant way to store your explosive Ammonium Nitrate. It is the strongest in Fire Rated Storage and fully customizable. We will build your storage building to your specifications, while meeting the highest safety standards for your explosive storage. This building may be built with our optional Explosion Relief Construction to protect your personnel in the event of an explosion. Our SUPERLoc Fire Rated storage building is designed to be fully compliant with government regulation and built to safeguard your personnel, inventory, and equipment in the event of a fire or explosion. This chemical storage building is built with superior strength, giving you more freedom in building placement, and ensuring you of the safest chemical storage solution.